Any fans of Pokemon here? I have to admit, growing up, I was never really into it. My little one has gotten into it since the release of Pokemon Go. 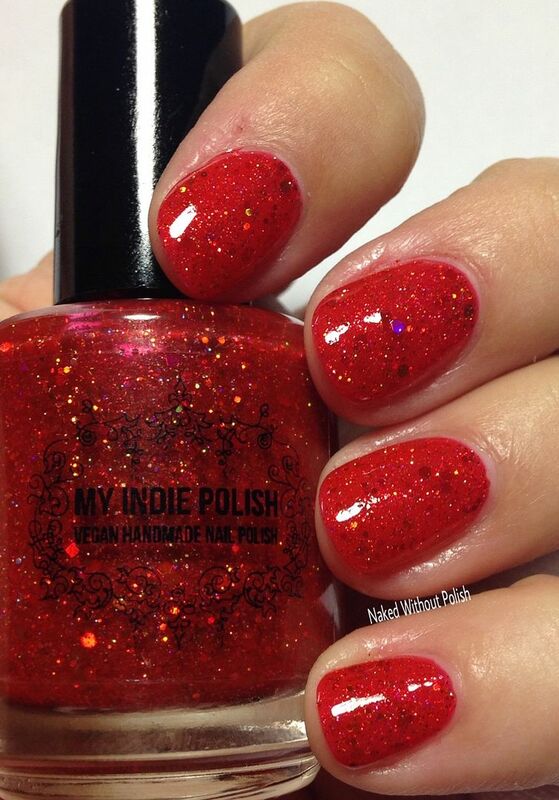 Every year, My Indie Polish releases a collection inspired by Pokemon. Well, it's more of one big collection that she just keeps adding to every year. 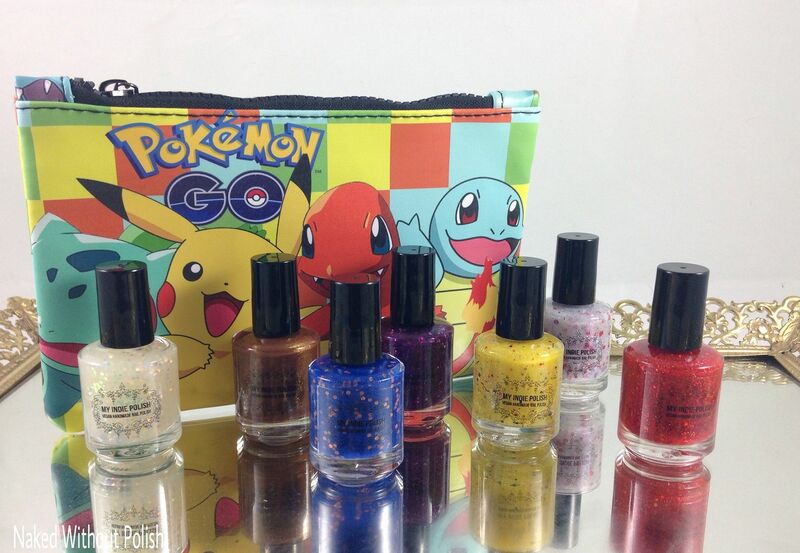 This year, the Pokemon Collection is growing by seven polishes. Each one is unique and perfectly captures what they represent. Ready to catch a few Pokemon? Let's go! 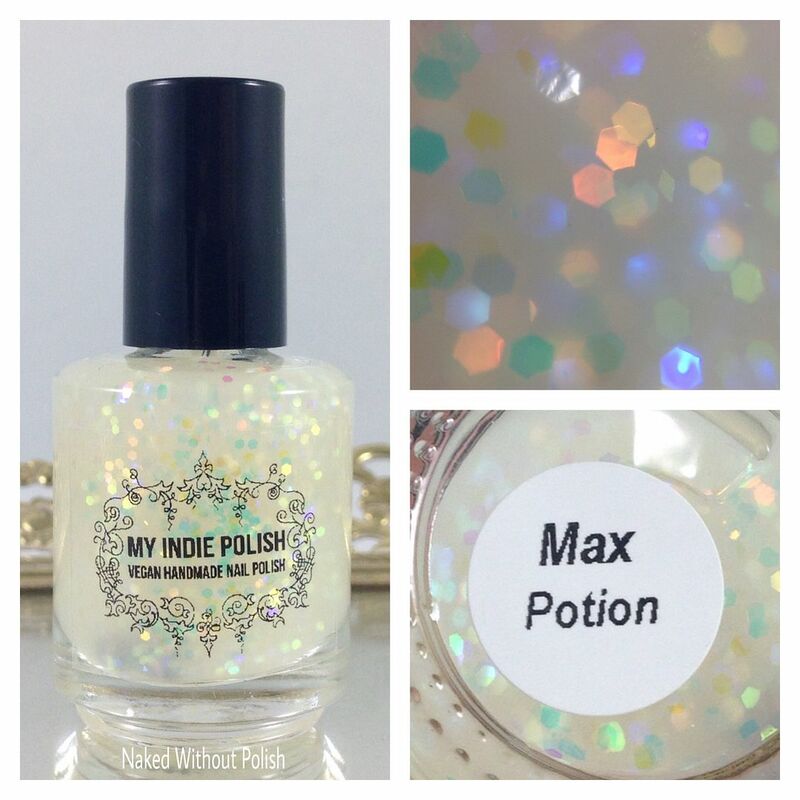 Max Potion is described as "a neat iridescent topper with multi chrome glitter". 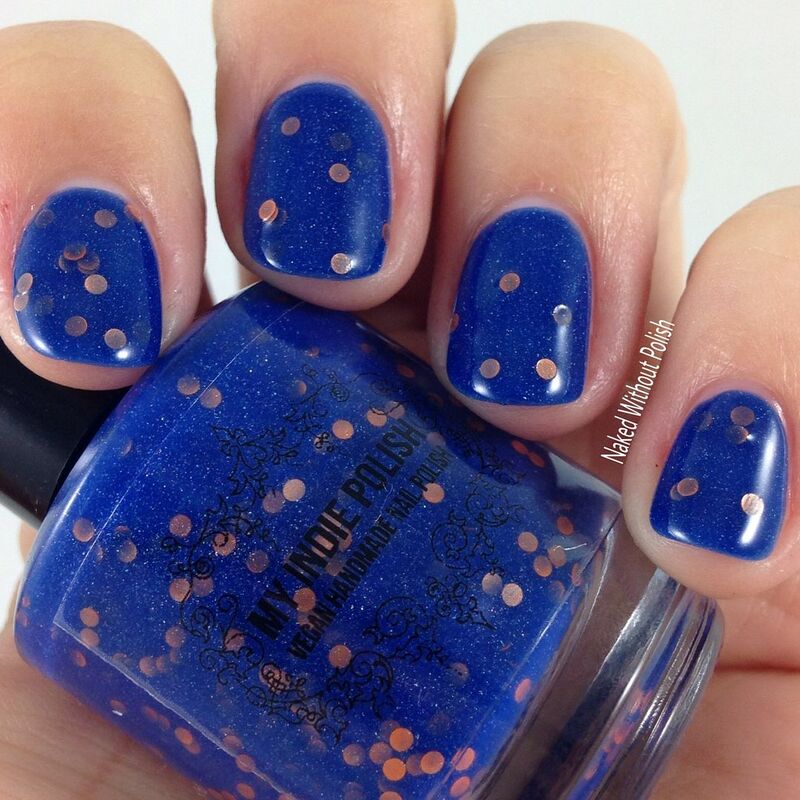 Shown is two coats of Max Potion over a matte navy blue polish with fast dry top coat. Max Potion is everything! 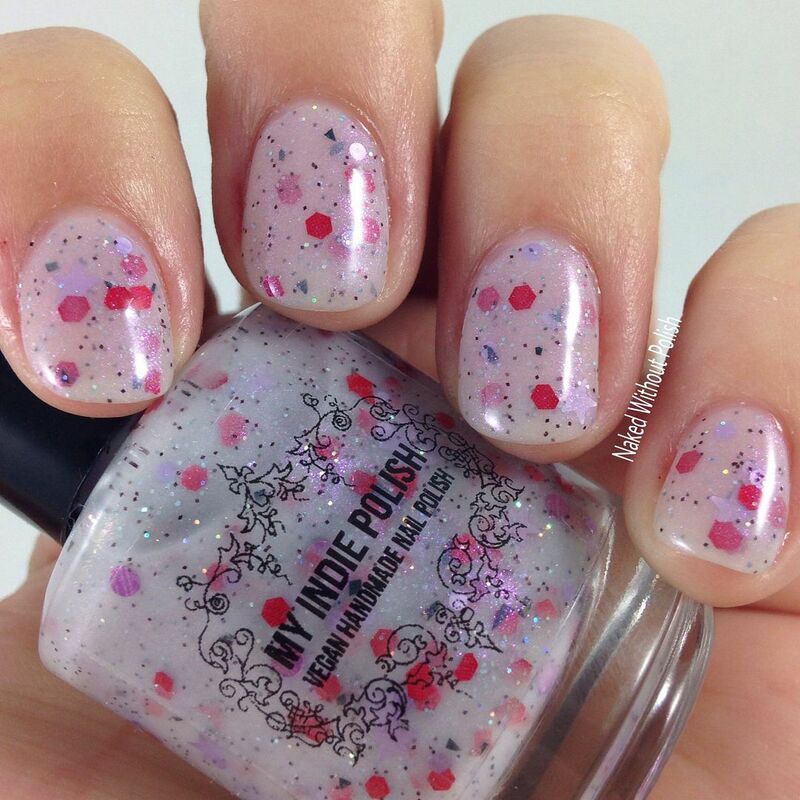 You need this polish! 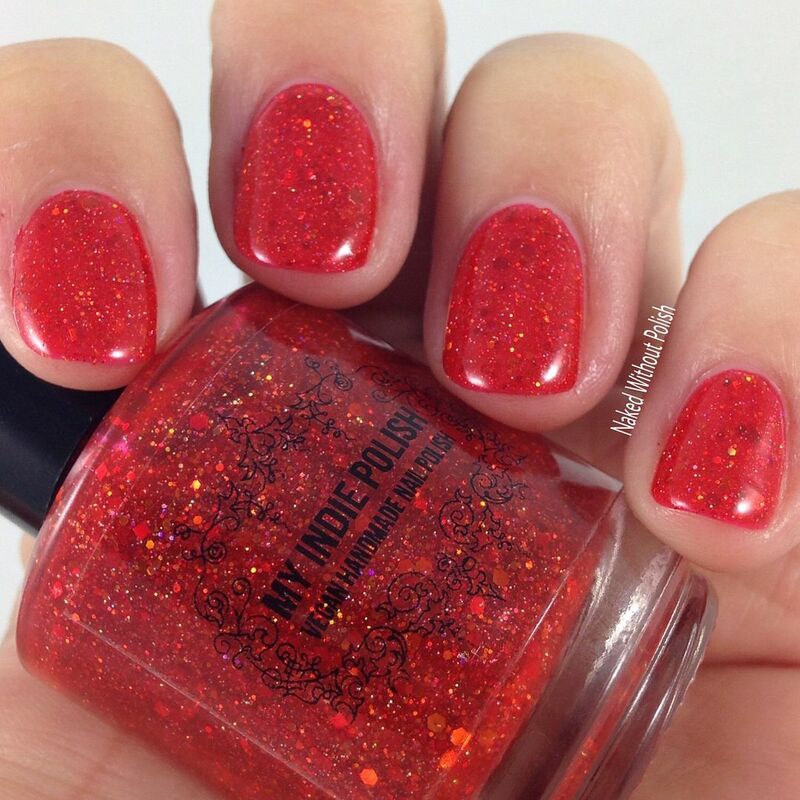 There are a lot of words that I said when I put this polish on. I can repeat them here, but you never know who is reading. These beauties light up like Christmas trees. Absolutely beautiful! 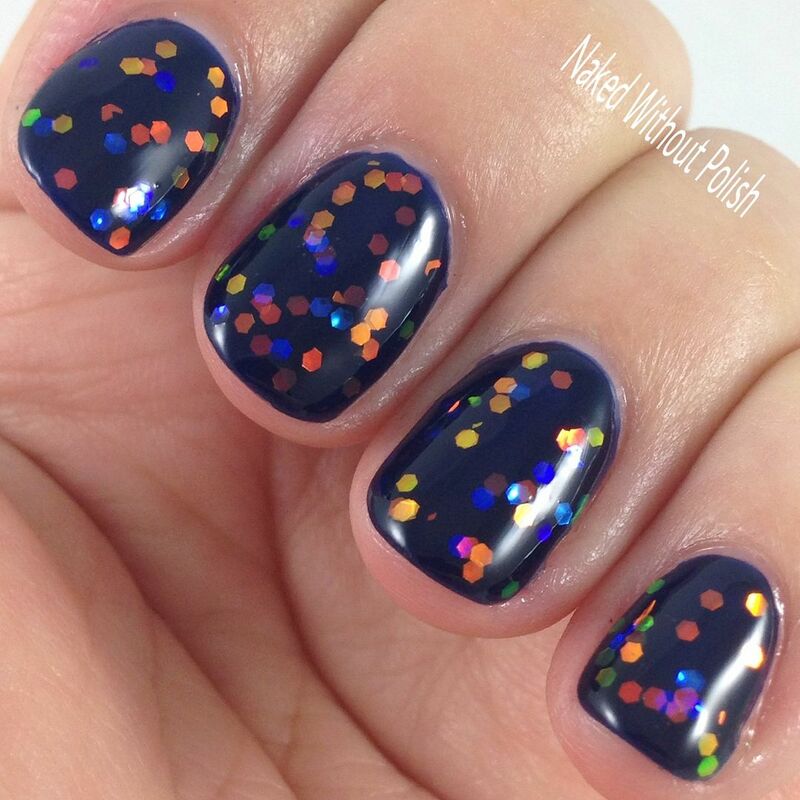 It varies on how many glitters you get out for each coat. Sometimes you'll only want one coat, other times you may want more. Your choice! But this is a must have! 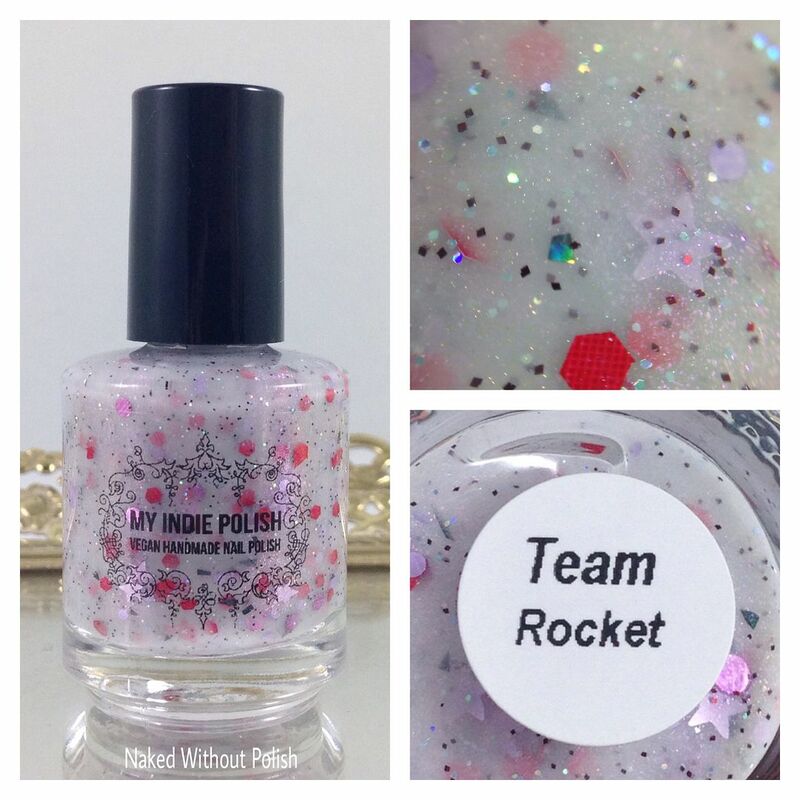 Team Rocket is described as "a white crelly with pink shimmer, and an abundance of various glitters". 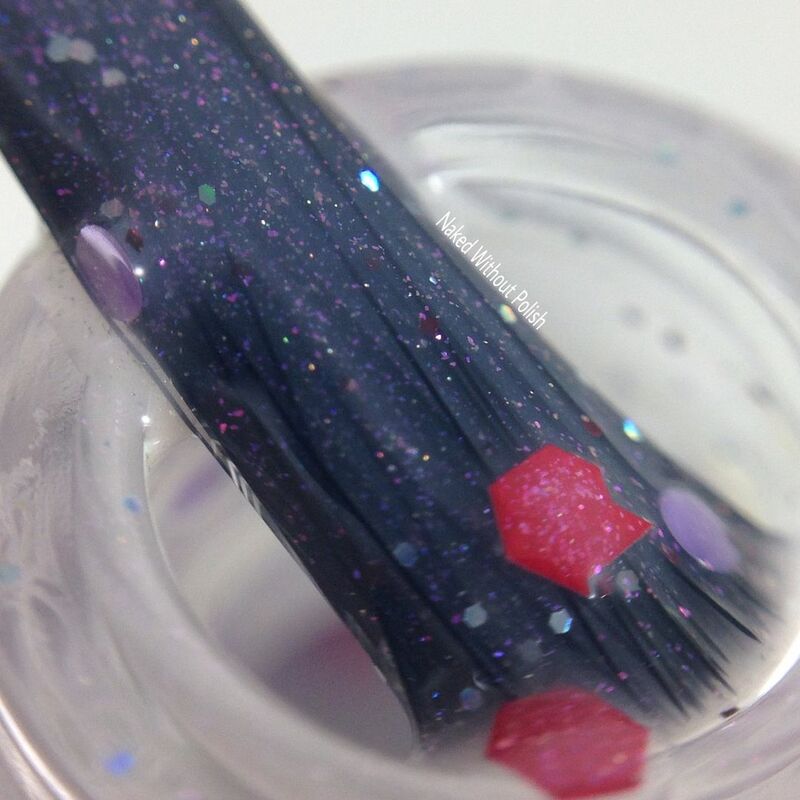 Shown is three coats of Team Rocket with fast dry top coat. 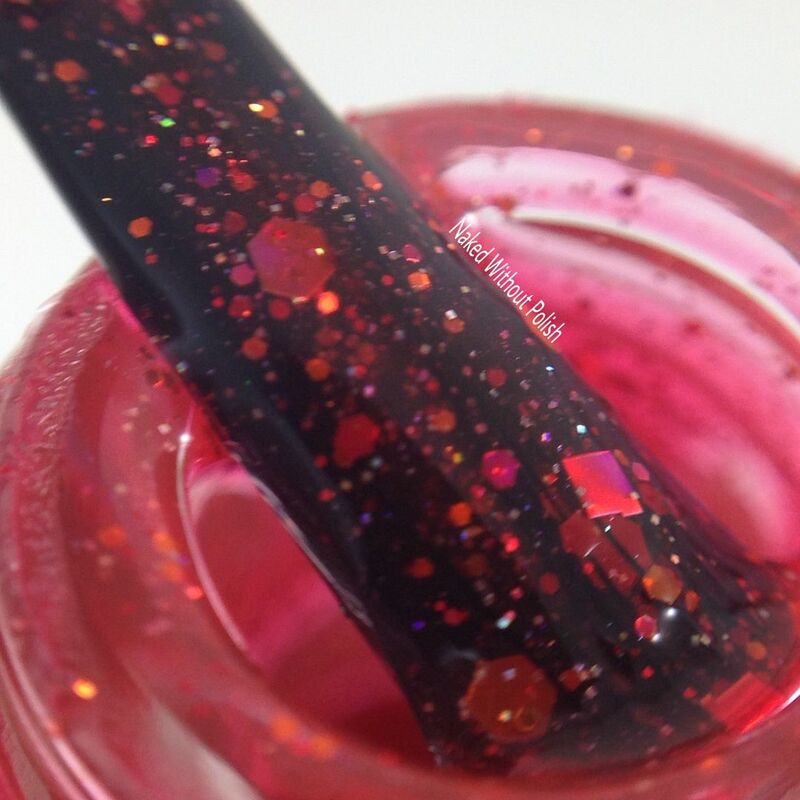 Team Rocket is super sheer, so make sure you apply with thin coats. 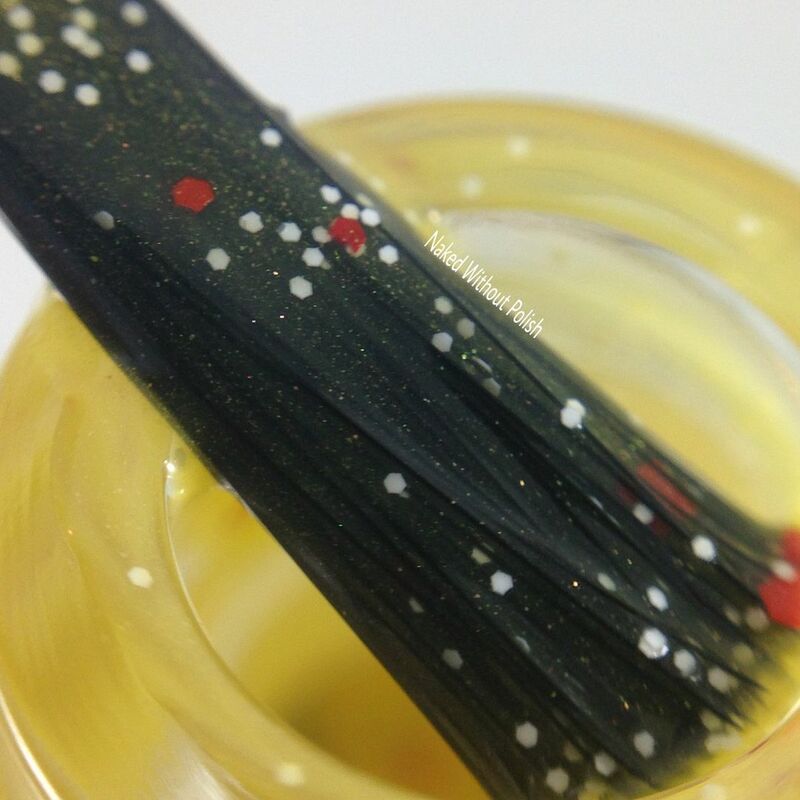 You'll get plenty of glitter out with the layering and no worry of fishing. 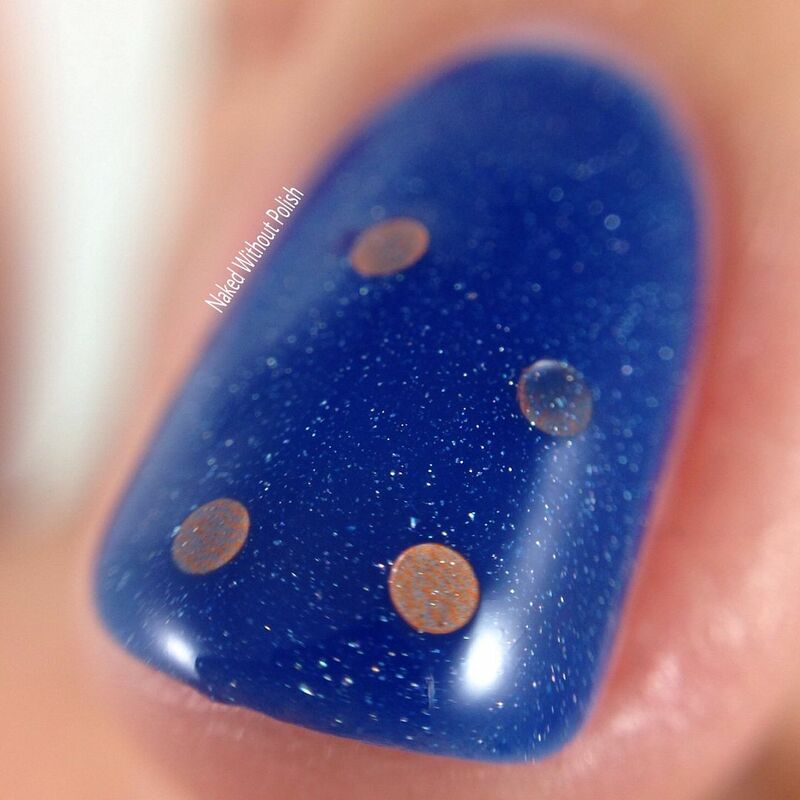 You could easily use this over a more opaque base as well. Versatile and playful! 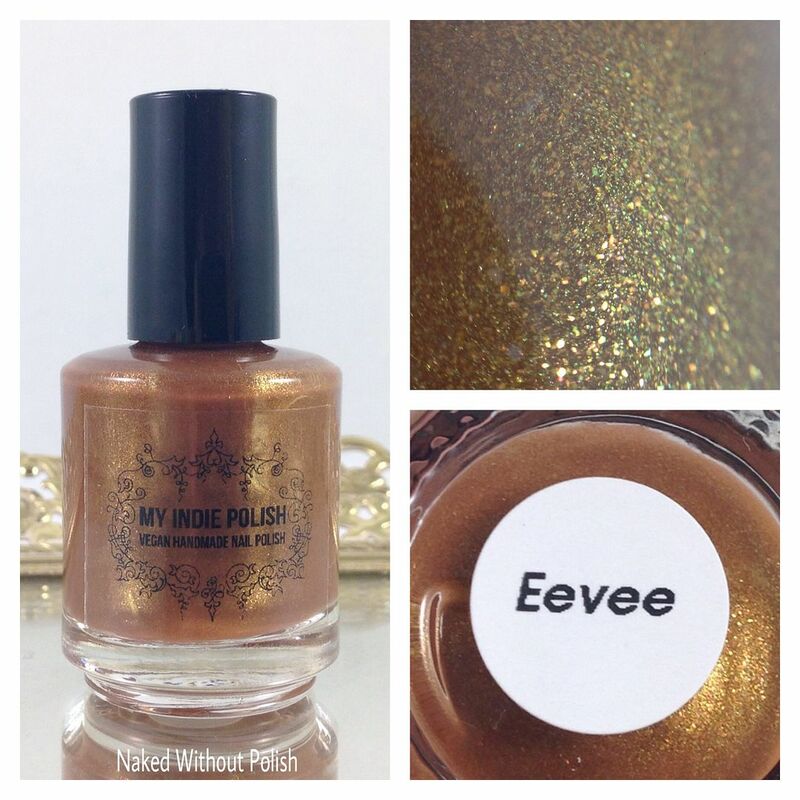 Eevee is described as "a red based brown with with gold shimmer and bronze/gold pigment glitters". 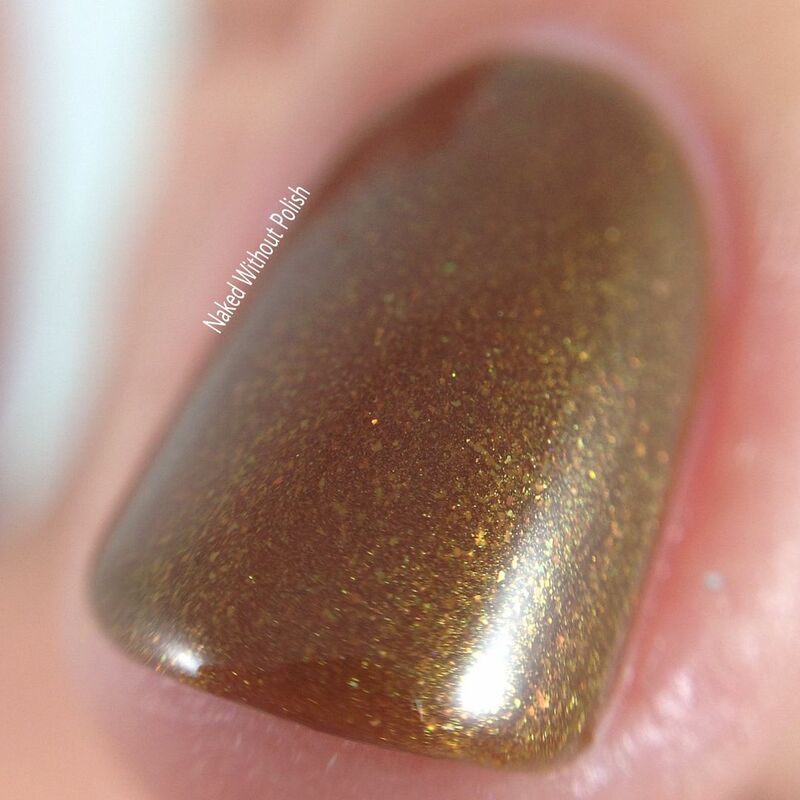 Shown is two coats of Eevee with fast dry top coat. 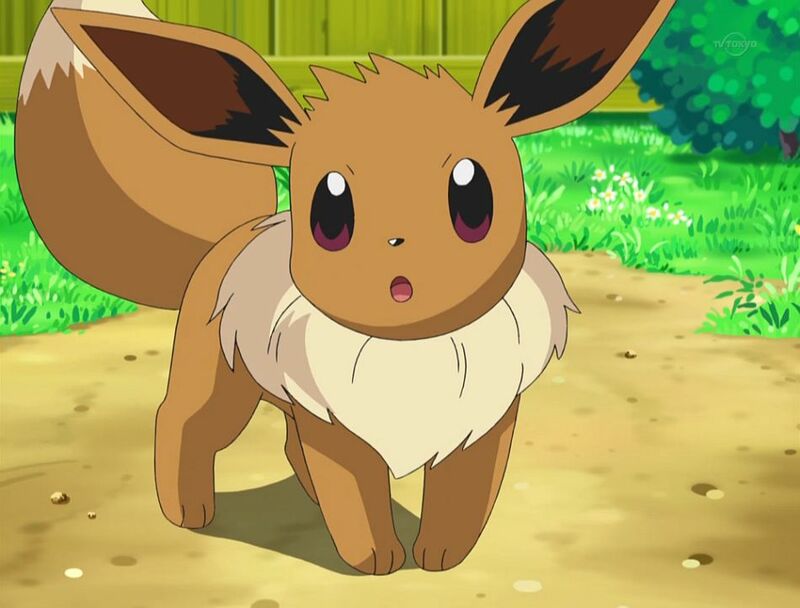 Eevee is just like the character it is inspired by...warm and cuddly. 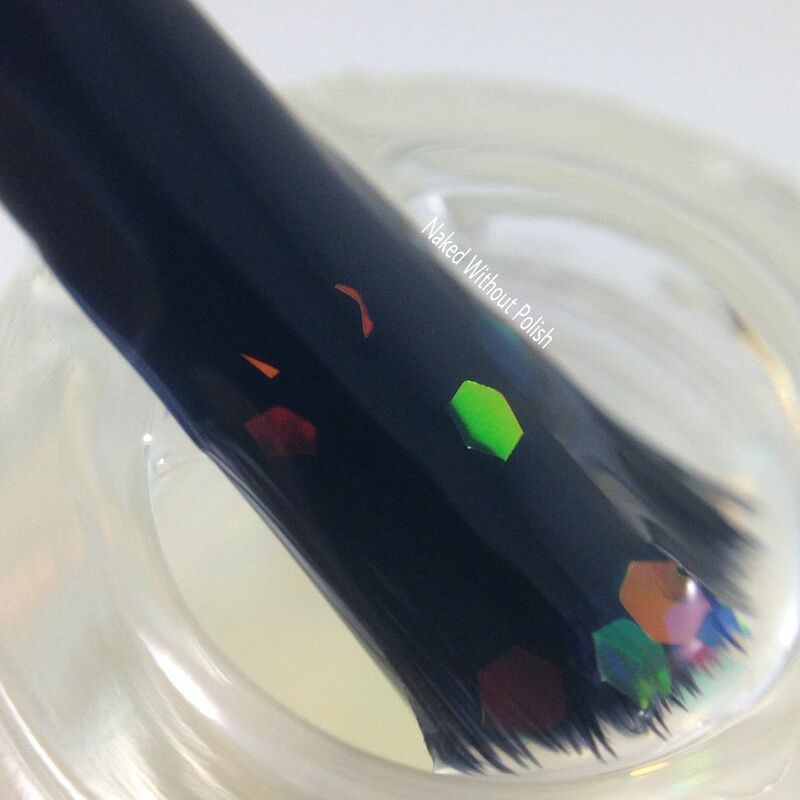 Wonderfully smooth application and quickly opaque. This is one of those browns that you'll find yourself reaching for quite often. 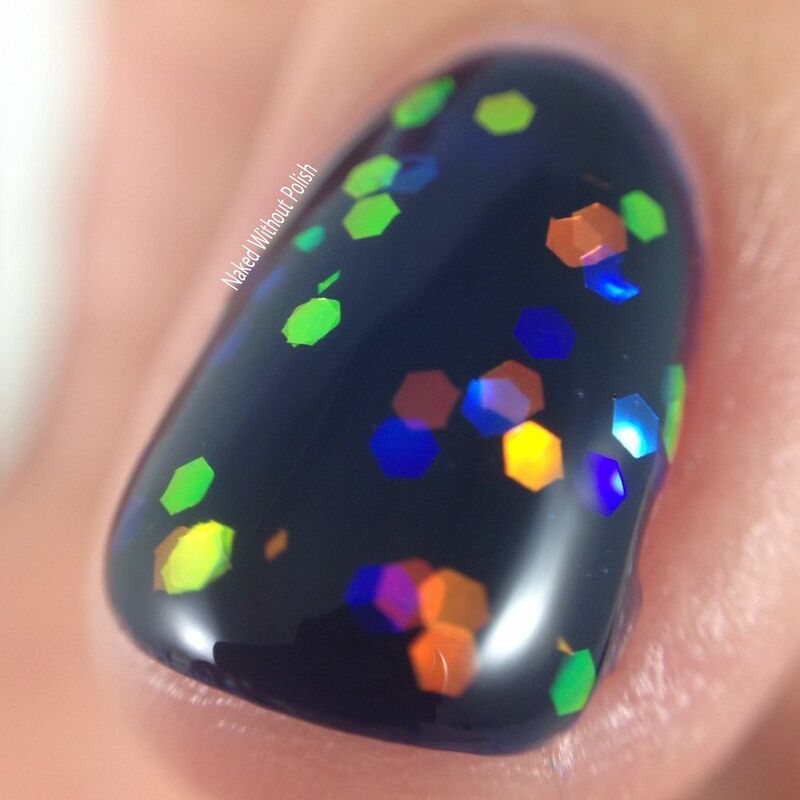 Use it as the base for some fun nail art for sure! 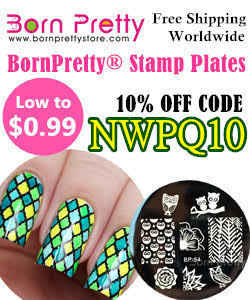 I'd like to see if it could be used in some stamping though! 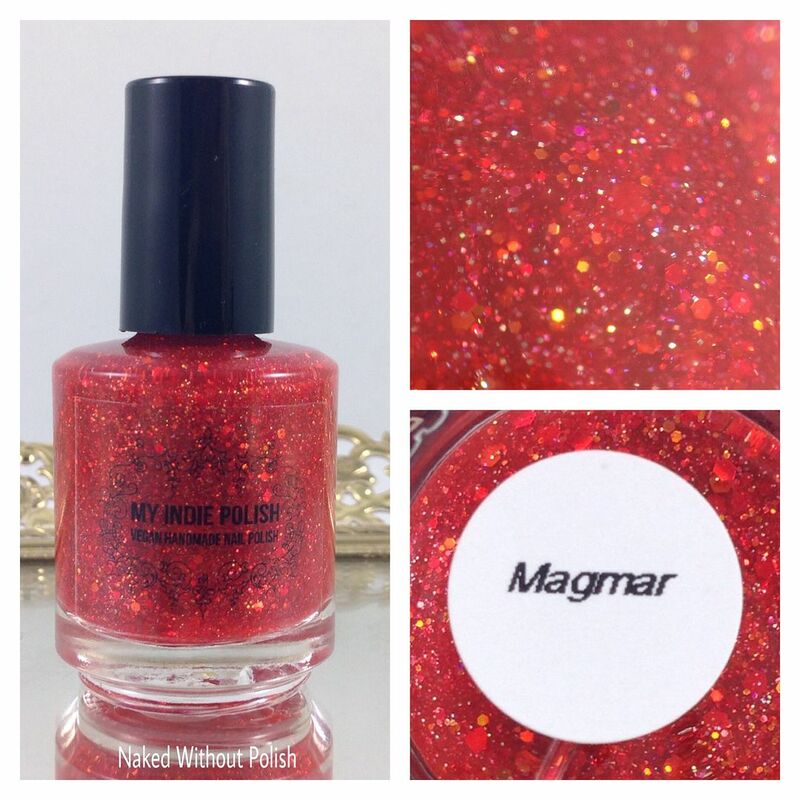 Magmar is described as "a sheer but full coverage red jelly". 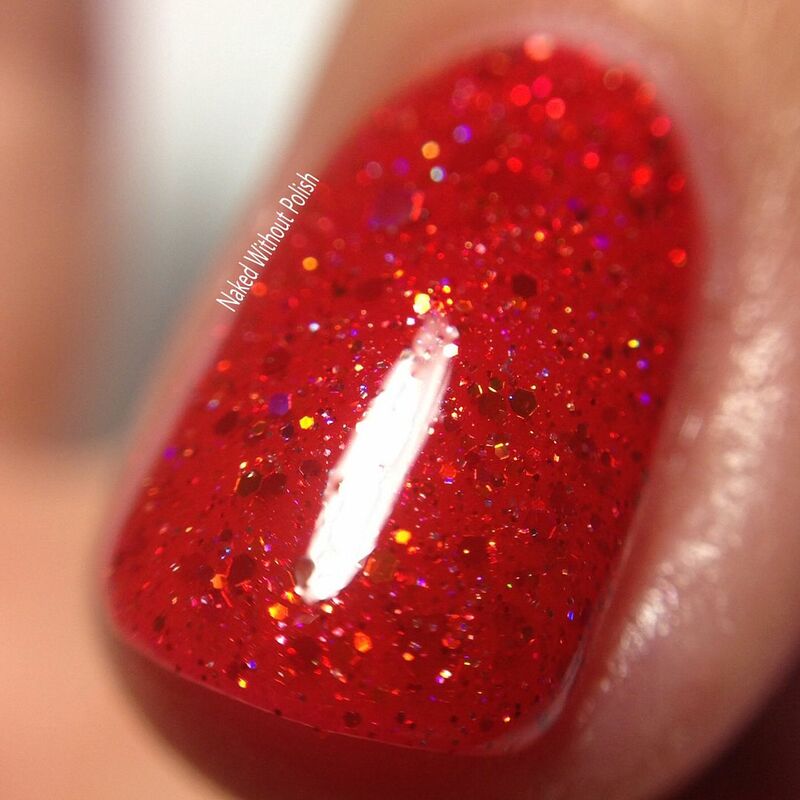 Shown is three coats of Magmar with fast dry top coat. 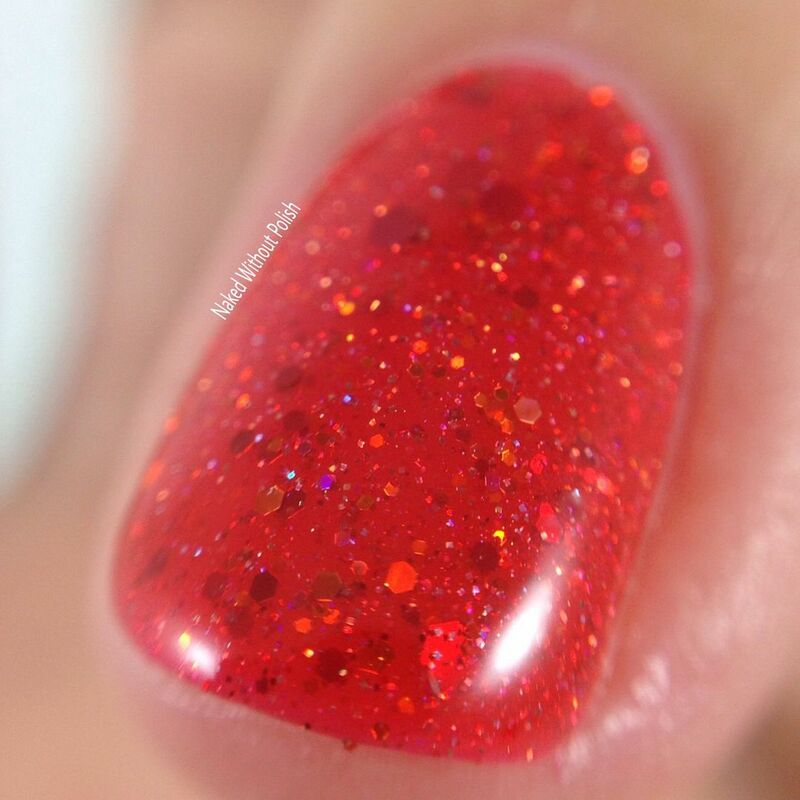 Magmar is squishy, sparkly, and fiery! 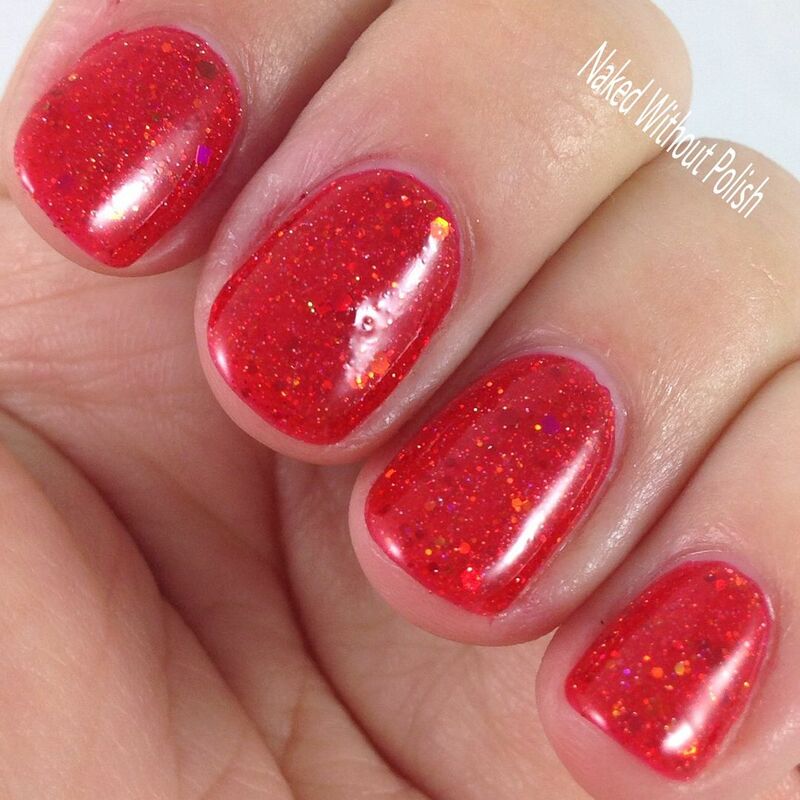 The perfect triple threat for a beautiful red polish. It does apply sheer, but is buildable. 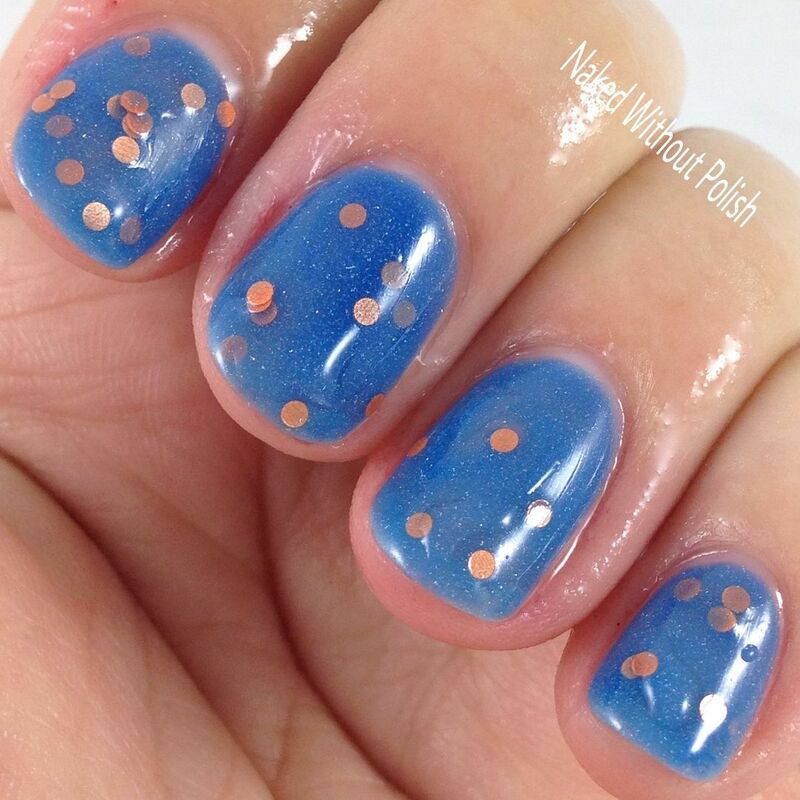 Three beautiful coats is more than enough to get full opacity and to keep that smile on your face. 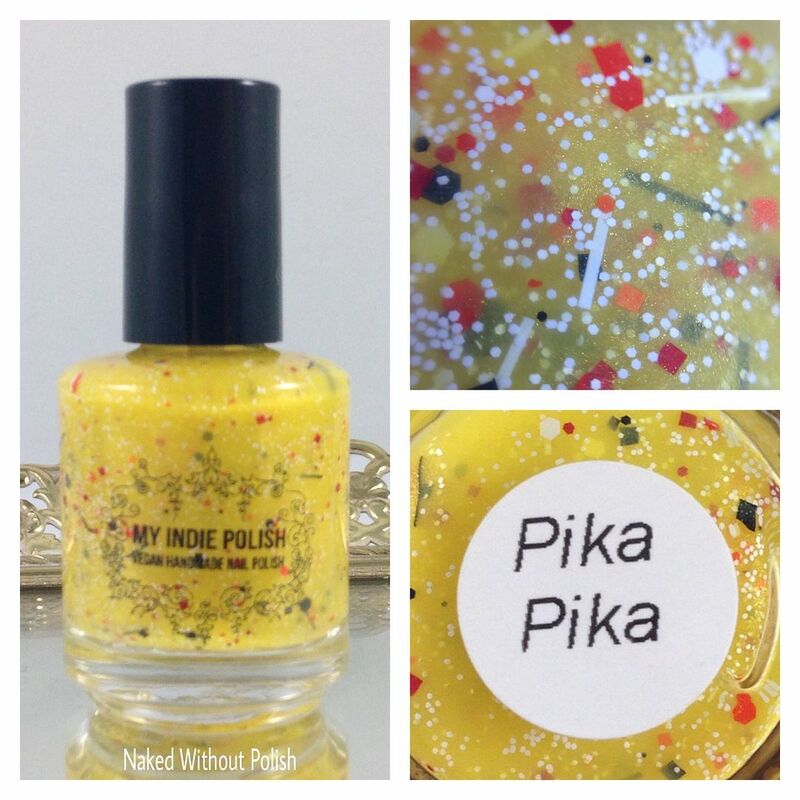 Pika Pika is described as "a bright yellow crelly with a mix of red, white, and black glitters in various shapes". 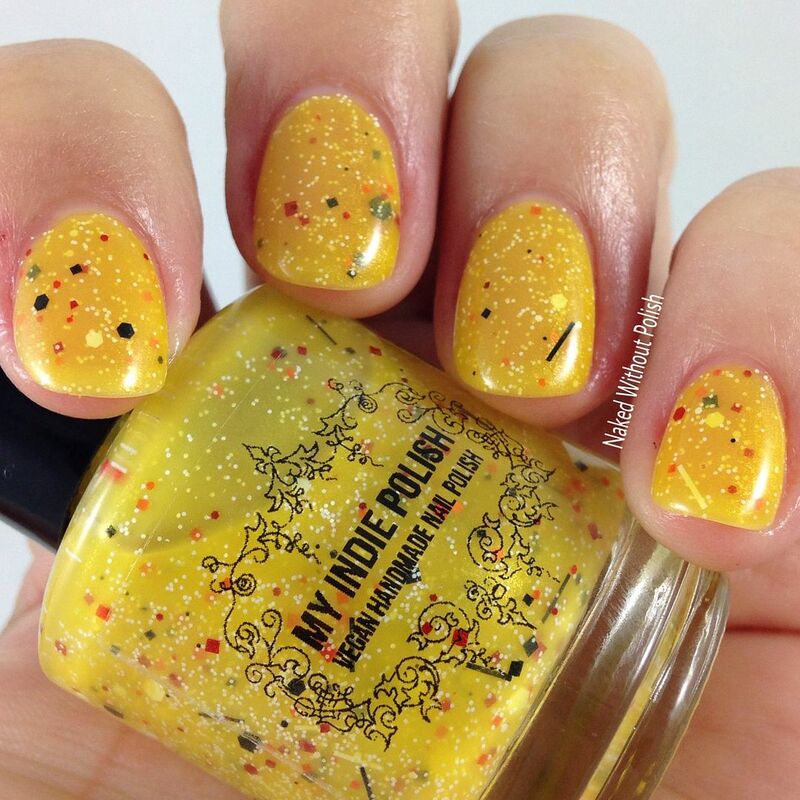 Shown is three coats of Pika Pika with fast dry top coat. 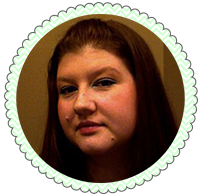 Pika Pika is bright and cheerful and will make sure your day the same way! I know...I know..."I'm not a fan of bar glitter". Well, neither am I! 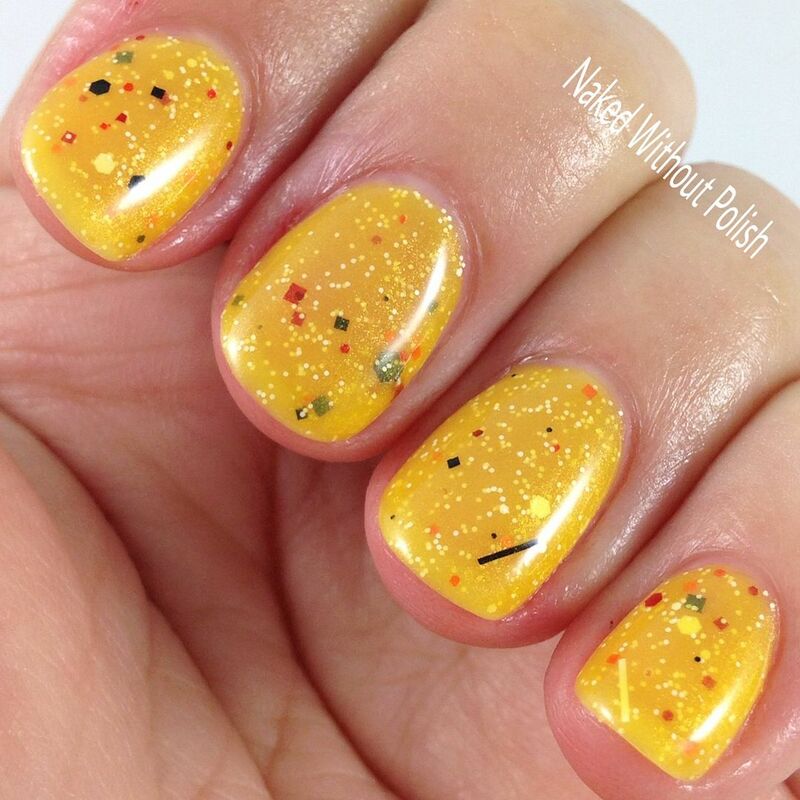 When it comes to Pikachu, you won't give a damn if there are bar glitter or not. You'll smile, and giggle, and you'll be happy. 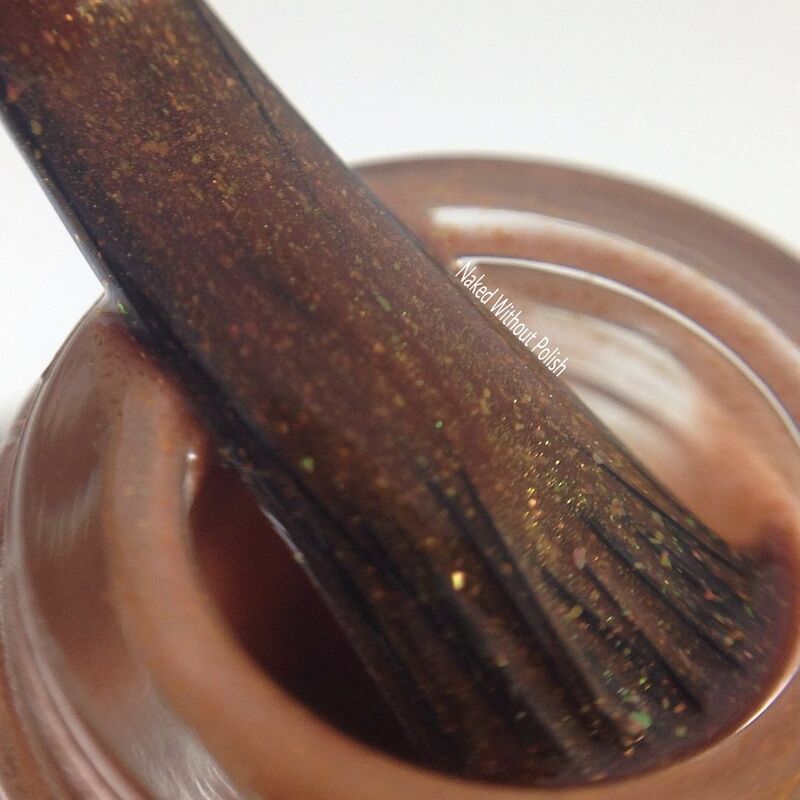 You won't be growling saying "I hate bar glitter". I mean how can you be anything but happy when Pikachu is around? 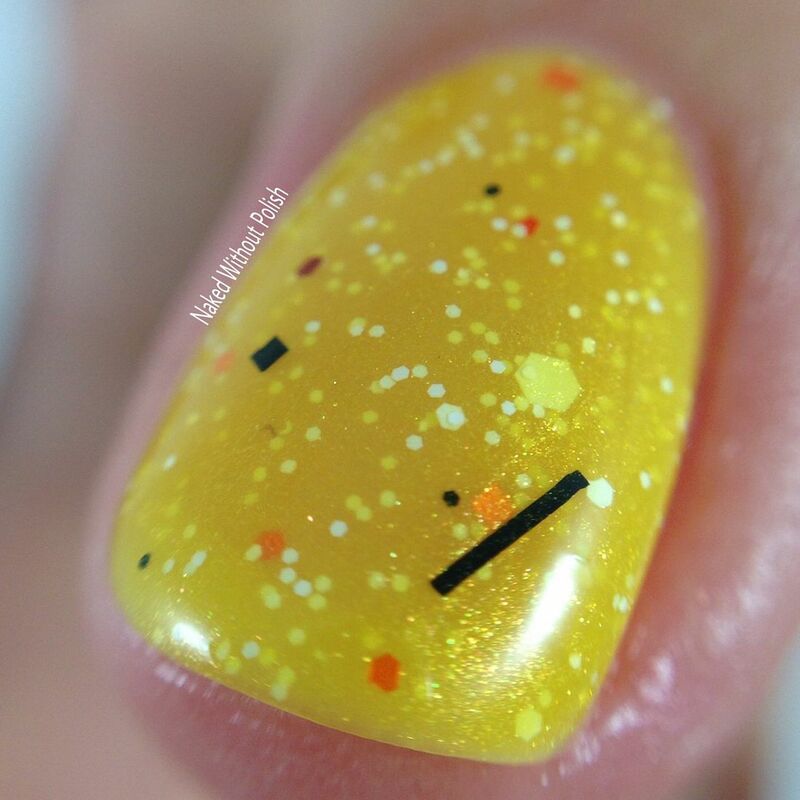 It is sheer, so use thin coats so it will build without getting thick, or toss it over an opaque base that would work well with the yellow base. 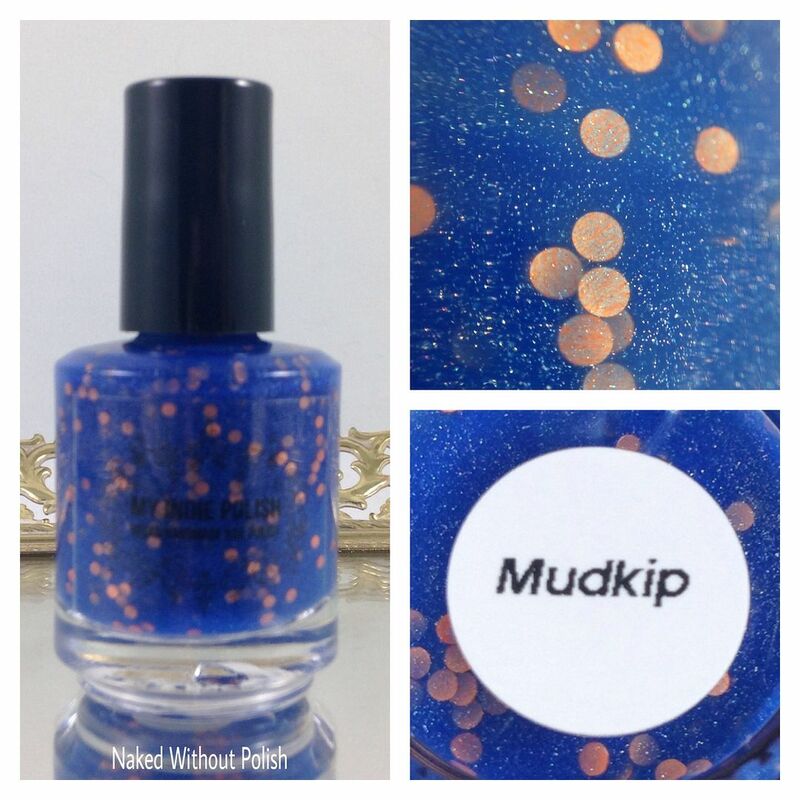 Mudkip is described as "a light to dark blue thermal with neon orange dots". 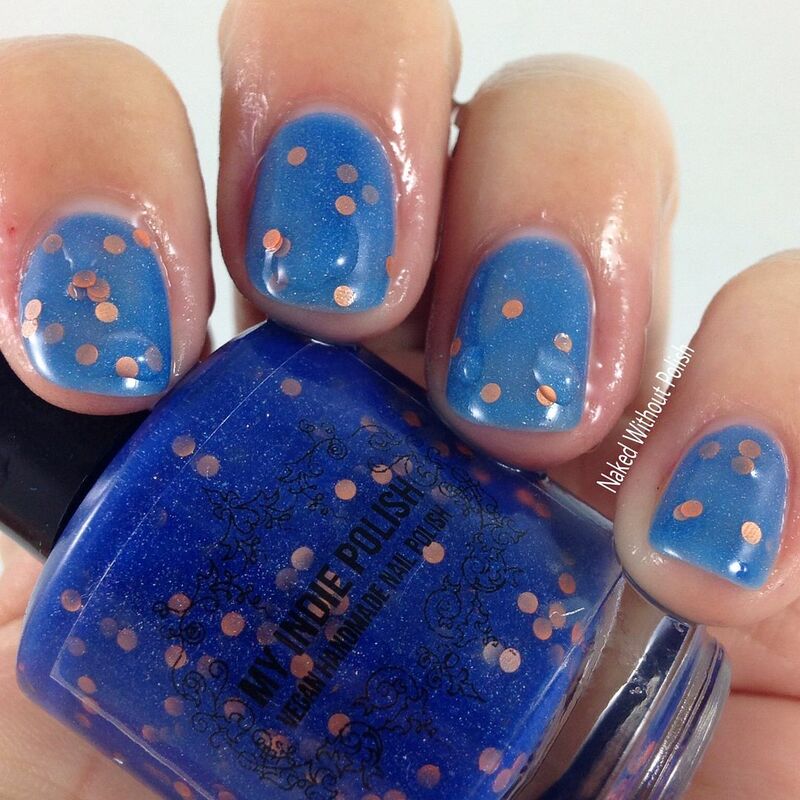 Shown is two coats of Mudkip in cold form with fast dry top coat. Mudkip is a brilliant blue when cold. 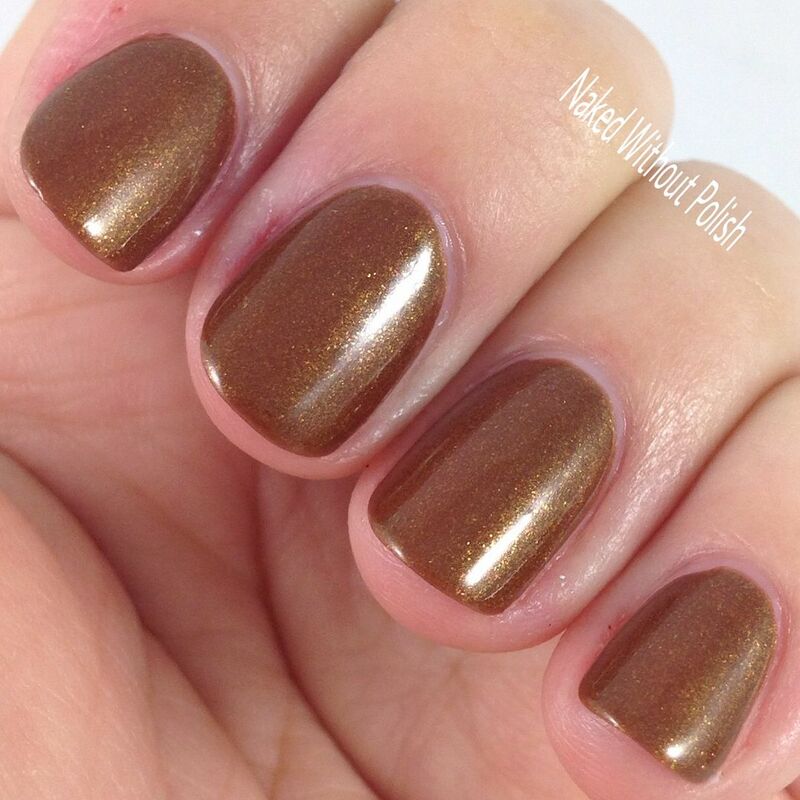 Two coats suffices there, but once it is warm and changes, it is a little sheer. I kind of wish I'd done three coats to be safe, but I still don't hate this. 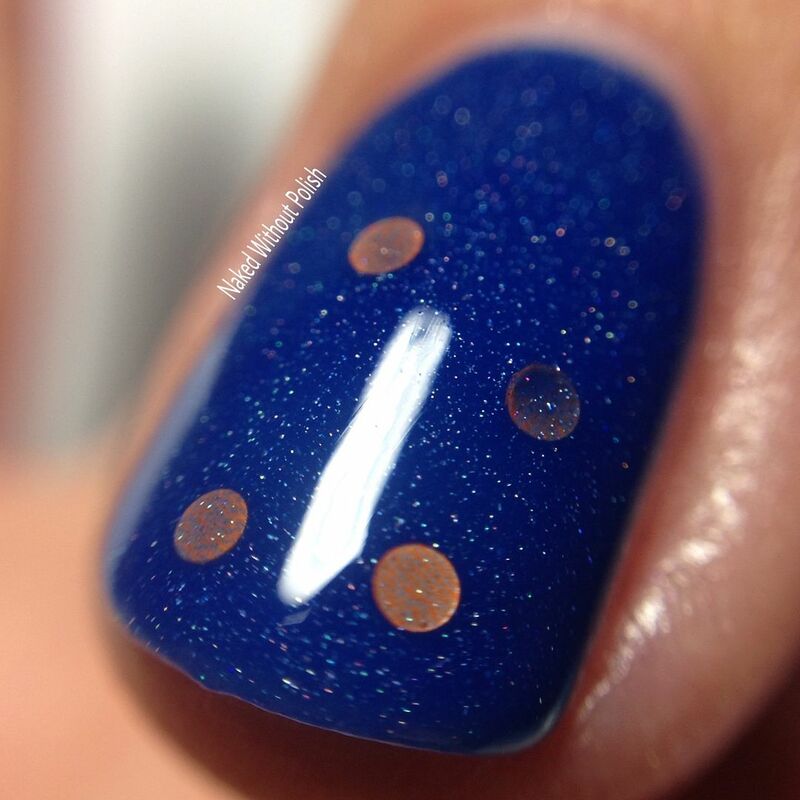 You get the holo shimmer beautifully in both versions, and the peach dots look great in both shades of blue. 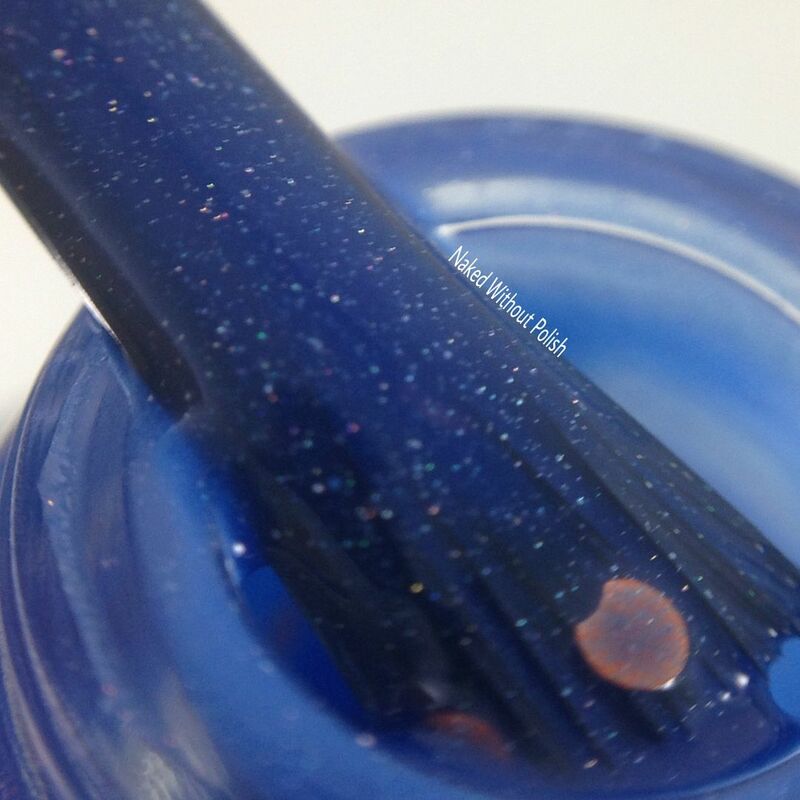 Smooth application and zero fishing for the dots. 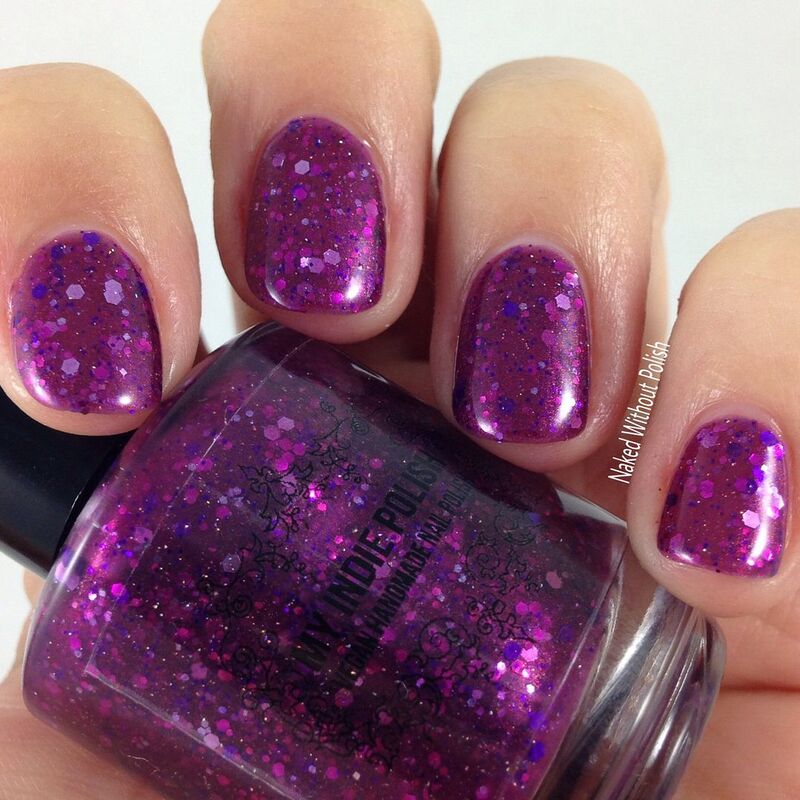 Haunter is described as "a sheer but full coverage purple glitter jelly". 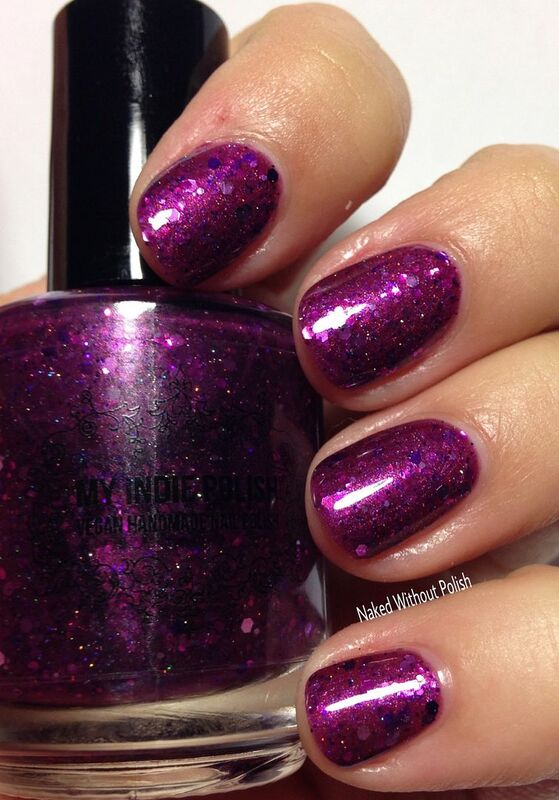 Shown is three coats of Haunter with fast dry top coat. 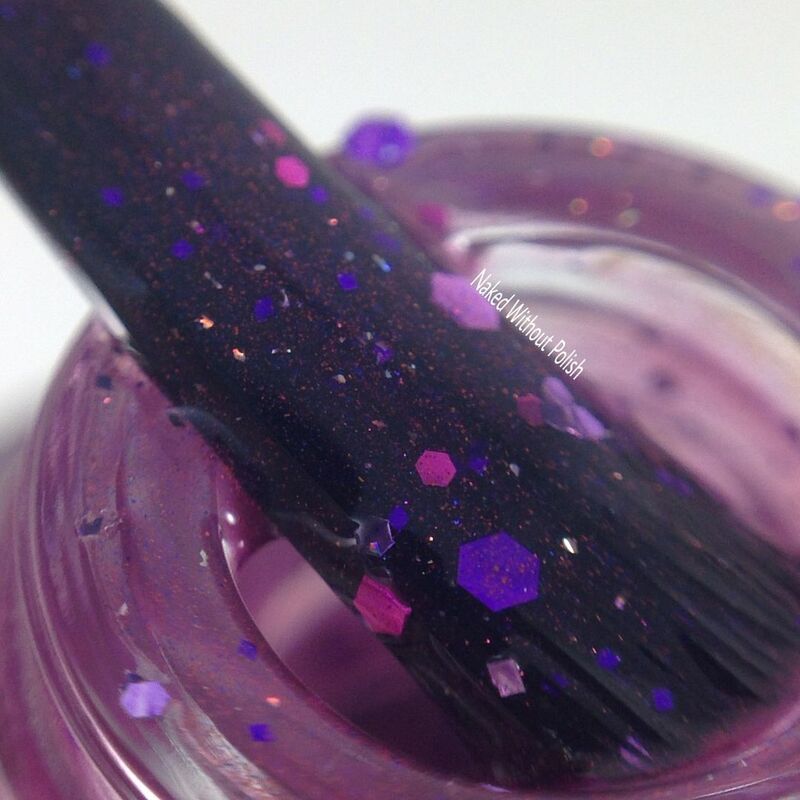 Haunter is such a marvelous shade of plum with a hidden pink shimmer. 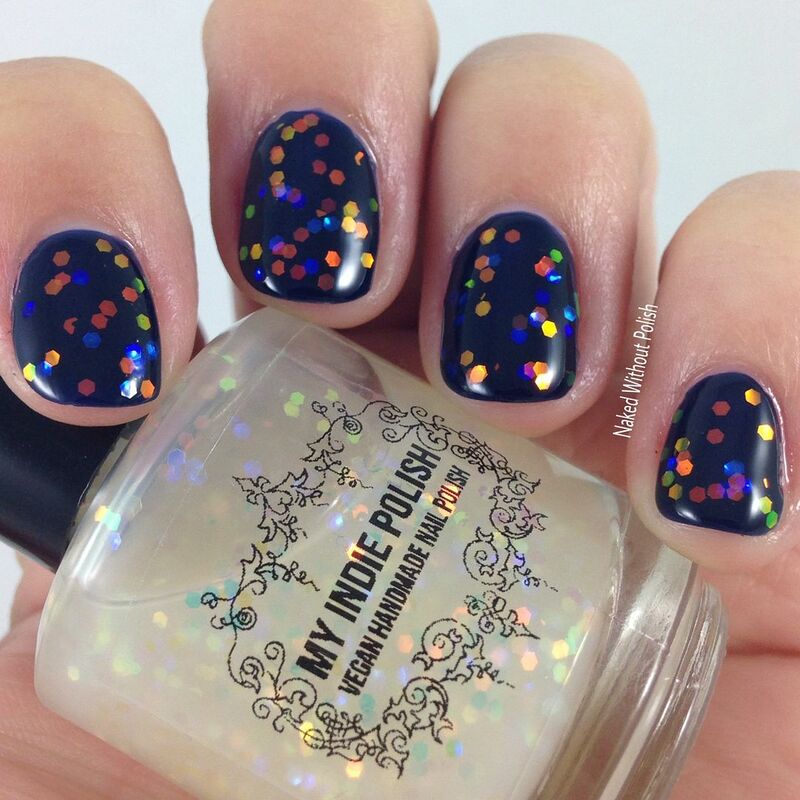 The multitude of glitter just adds to the beauty. Application wasn't difficult with all the glitter. 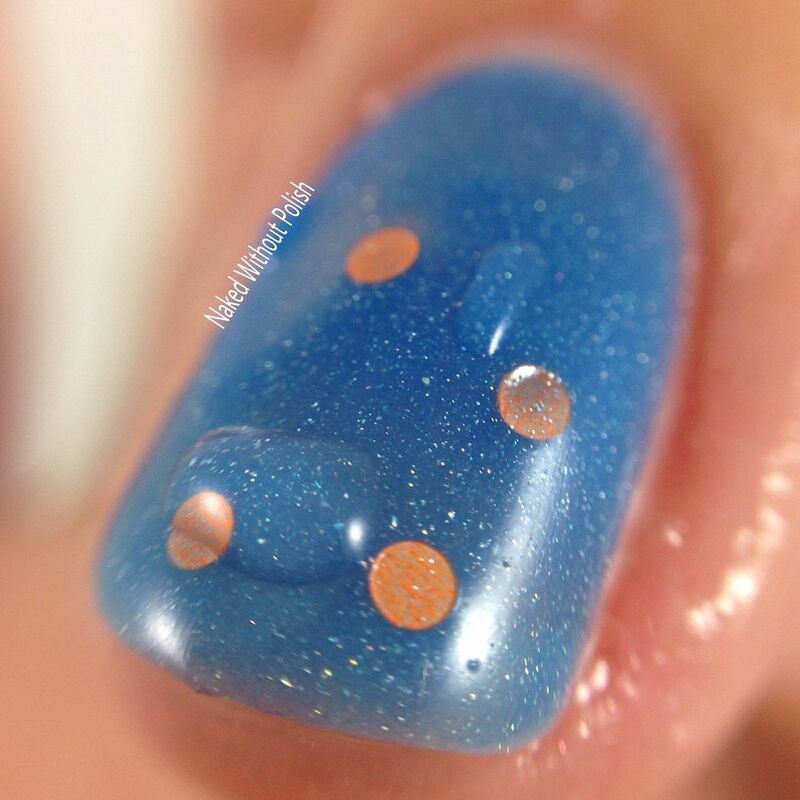 It is a bit sheer so do at least three thin coats for full opacity. 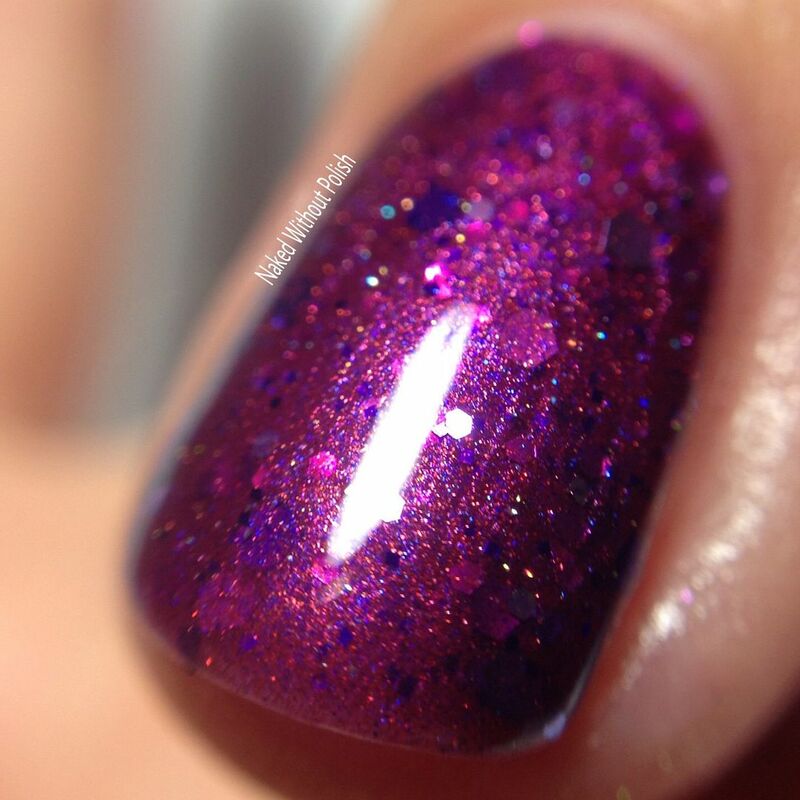 It is also one that could be layered over an opaque purple so you can marvel at its simple beauty as one coat. 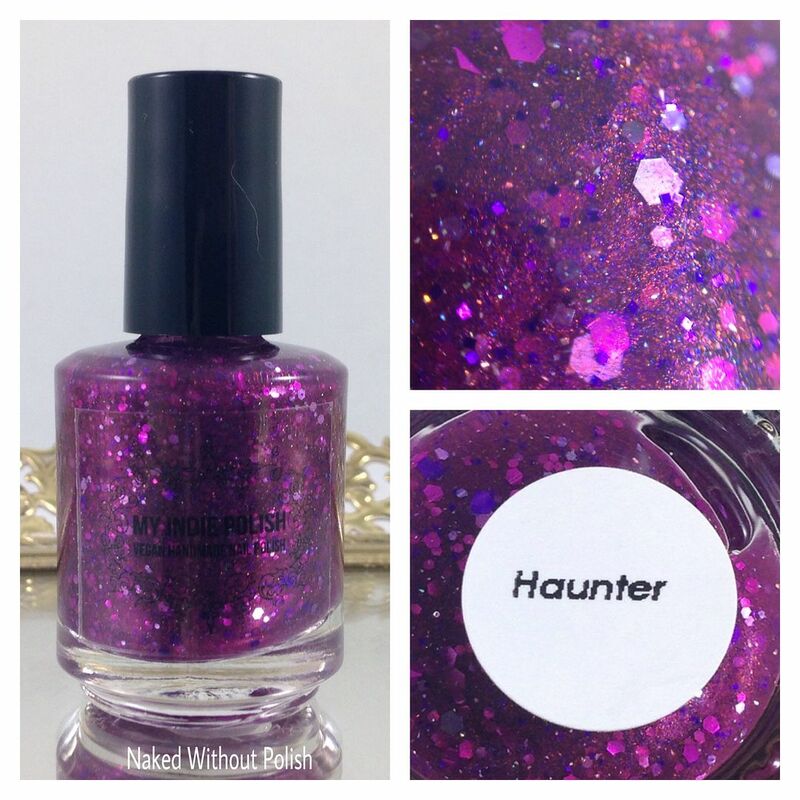 Use it over a black to get a better use out of the name...Haunter...I guarantee it will leave you a bit spooked. The 2016 Pokemon Collection will be available on November 1st at noon EST. 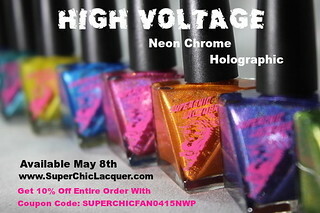 There will be three different ways you can get these polishes. The first way is individually: 8$ for mini sized bottles and 13$ for full sized bottles. The second way is full sets: 55$ for mini sized bottles and 90$ for full sized bottles, you get free shipping with both of those options. The third way is a deluxe set: 105$ will get you all seven full sized bottles, a Pokemon Go vegan leather make up case (that was shown in my group shot photo at the beginning of the post) that will be filled with Pokemon stuff, including some rare/hard to find cards that Tanya has collected over the past 20 years. These are limited edition so make sure you don't miss out on any of them! 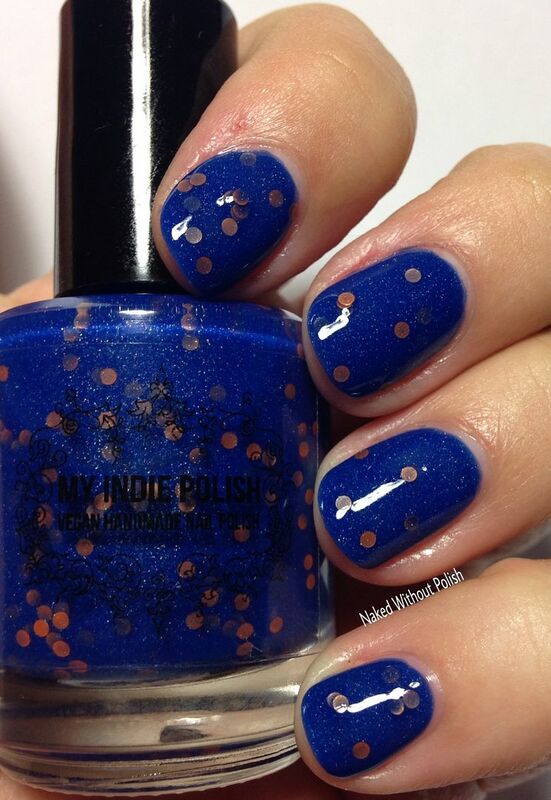 Keep in mind that My Indie Polish is a Canadian brand, so these are all listed in Canadian dollars. 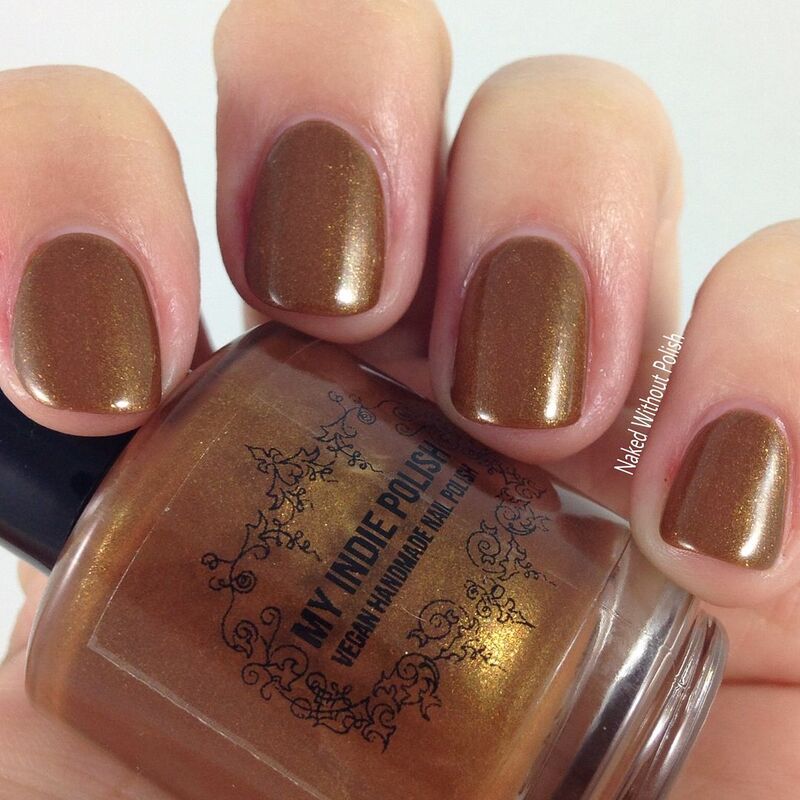 Make sure you are following My Indie Polish on all of her social media platforms (links below) to stay updated on news, releases, restocks, and sales. This Pokemon inspired collection is lovely, versatile, and well rounded. What did you all think of these? Have you bought any of her previous Pokemon collections?